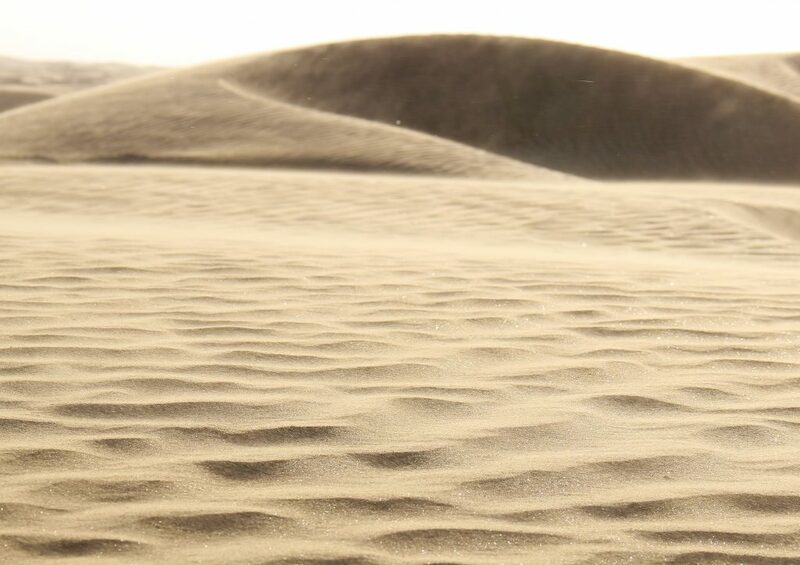 The Great Green Wall project designed to plant trees to stop the advancement of the Sahara Desert, now presents the tremendous potential to curb climate-induced migration, unemployment, and growing insecurity from the Boko Haram terrorist group in particular among the youths and vulnerable communities, experts have said. The Pan-African project that began five years ago has now evolved to a practical slate of activities that is improving the livelihood of the poor, building resilience in herders and farmers’ communities as climate change continue to threaten. "The program has moved from just forest to tackle land degradation to other sustainable development challenges like land and water management, climate change, insecurity, job creation particularly for youths with many more countries embracing the initiative,” says Elvis Paul Tangem, African Union Commissioner in charge of the project. "The initiative now combines sustainable land and water management programs, agroforestry and tree planting, agriculture development and the fight against climate change,” Tangem told InfoCongo in an interview at the African Forest Forum held in Lome, Togo on September 30, 2016. “Though sustainable development activities are counted amongst the innovations fronting the successes of the program, the continental political engagement and vision in agreeing for a harmonized approach to the execution of the different country and regional actions is cardinal,” he explained. Forest experts say the initiative is the largest environmental and development program undertaken currently in the continent, with more countries and regions embracing it after seeing the impacts and results achieved. Forest experts say the initiative is the largest environmental and development program undertaken currently in the continent. "Many more countries are embracing the initiative now than when it started because of the development successes registered,” says Dr. Tieguhong Julius Chupezi, forest researcher and consultant with the UN Food and Agriculture Organization (FAO) and African Forest Forum. "The initiative has provided the platform and framework were countries, development partners, and practitioners, researchers and all stakeholders concerned with land degradation, desertification and drought can come together and work with a shared vision,” Tieguhong said. 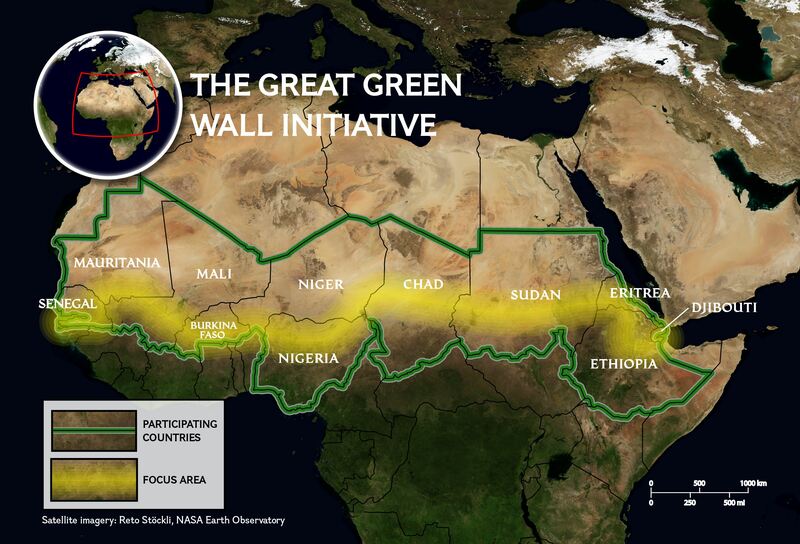 "The Great Green Wall initiative is increasingly seen as having the potential to tackle migration and insecurity issues that have continued to swell in many countries in the continent,” he said. 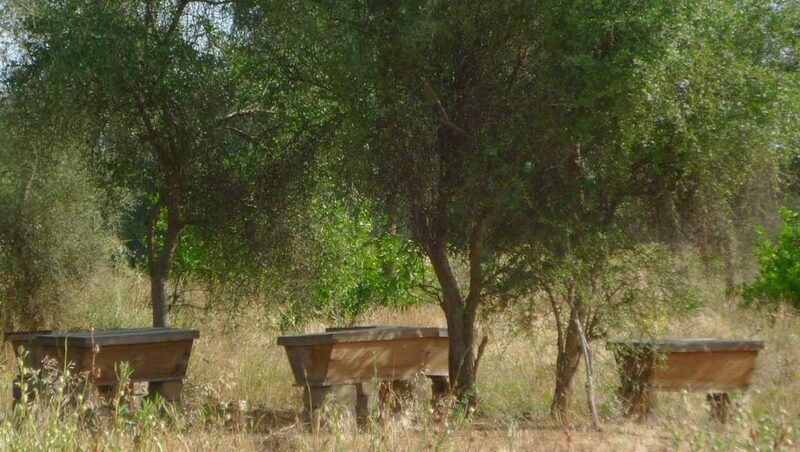 Senegal has so far planted over 12 million trees stretching 150 kilometers and covering 40,000 hectares of land. Over 21 countries are now involved in several projects and activities in support of the initiative from which runs from the circum-Sahara area to the Horn of Africa, according to African Union officials. These include Algeria, Benin, Burkina Faso, Cameroon, Chad, Djibouti, Egypt, Ethiopia, Eritrea, Libya, Mali, Mauritania, Niger, Nigeria, Senegal, Gambia, and Somalia, Togo, and Ghana. However Senegal, Mauritania, Chad, Niger, Ethiopia, and Nigeria are blazing the trail, epitomizing great examples with the development of market gardens that grow food and fruit trees for animals in the dry season, providing job opportunities for youths and thus curbing climate induce migration, said Tangem. Tangem says the Senegalese government intends to extend tree planting to about 545 kilometers covering 800,000 acres in the next few years. In Burkina Faso and Senegal, reintroducing animal feed and fruit trees for herders, vegetable market gardening, and eco-tourism is providing job opportunities for many young people and thus helping hitherto migratory population to stay in their communities. Improved farming and agricultural activities undertaken within the framework of the Great Green Wall project has resulted in job opportunities, empowerment of rural farmers and improvement of the livelihood of local communities in eleven states in the Northeast and Northwest of Nigeria. These states include Sokoto, Kebbi, Kano, Jigawa, Yobe, Bauchi, Borno, Gombe, Katsina, Adamawa and Zamfara. The African Union also argues that the project is helping in the fight against rising insecurity with at least 5000 youths who might have probably joined the Boko Haram terrorist group, now employed as firefighting brigades and part of the Great Green Wall forest guards, eco-tourism agents and women growing and selling vegetables. Sudan has restored 2.000 ha of land restored. Climate resistant trees and of multiple economic values are the ones planted in many of these countries. 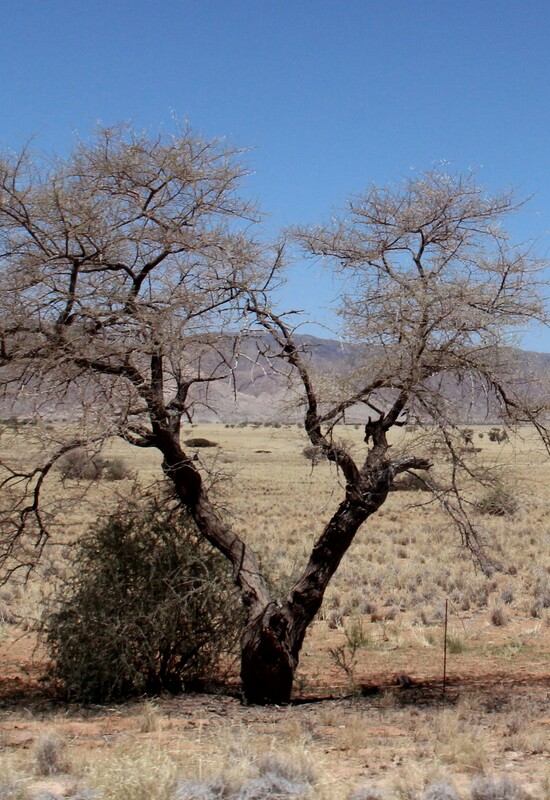 "The trees are mostly the acacia species that survive harsh climatic conditions and bring economic value since they produce gum Arabic, a product that used in food additives and products including pharmaceuticals and soft drinks, for which demand is currently outstripping supply. The trees also produce fruits, for which a new market has emerged and gained economic activity for women,” Tangem said. 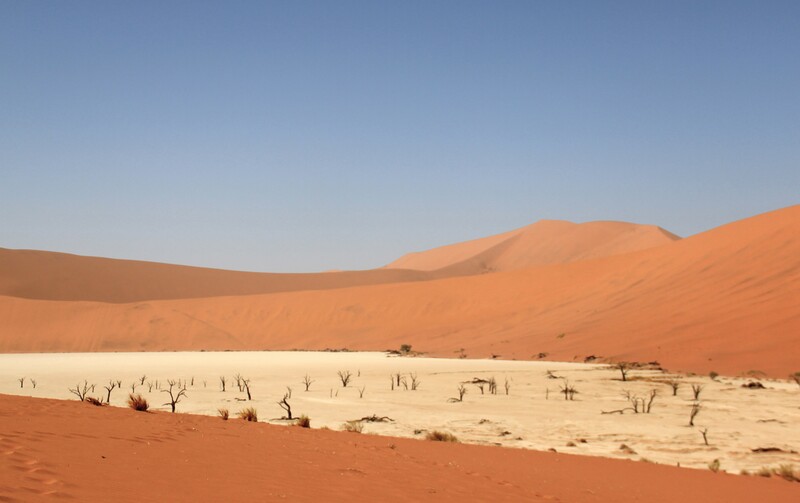 Land degradation, desertification, droughts and climate change impact many many communities across the continent, experts say. Forest, these experts argue is central to the solution. "The Great Green Wall is now becoming a real Pan African flagship program,” says Godwin Kowero Executive Secretary of the African Forest Forum. 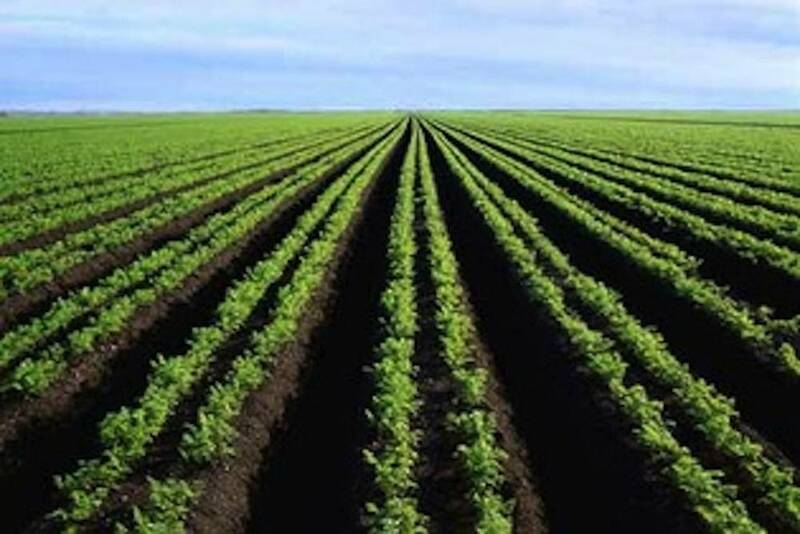 The project intends to restore 50 million hectares of land, provide food security for over 20 million people, create thousands of jobs, and sequesters 250 million tons of carbon, according to African Union officials. The African Union says financial support for the project is growing. At the COP21 conference in Paris, the UN climate meeting announced firm pledges of $4 billion of additional funds for the Great Green Wall project. The French government also agreed to increase its investment in climate resilience and programs by $1 billion by 2020. The president of the World Bank as well pledged $1.9 billion for the Great Green Wall and other, related programs. African Union officials recognize the criticality of the Great Green Wall Project to addressing the climate change crisis in Africa. 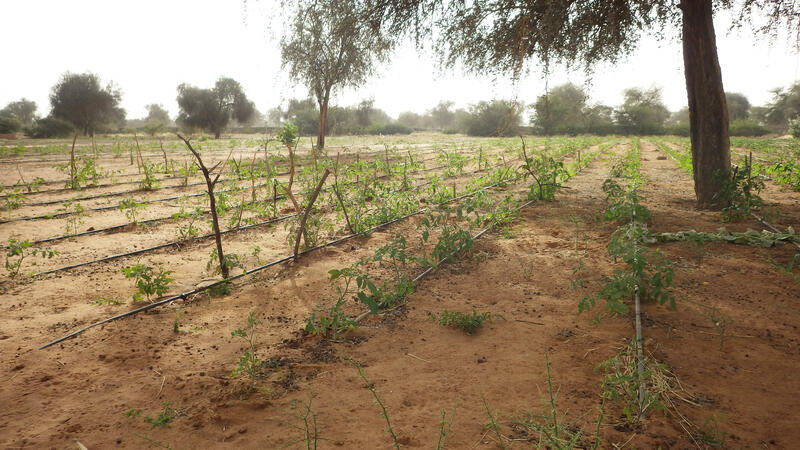 “The Great Green Wall is at the heart of development solutions for Africa,” Tangem says. According to the UN, over a 100 million Africans are threatened by growing desertification. 2015 and 2016 saw the worst drought in 30 years with severe effects on many communities on the continent. United Nations statistics say two-thirds of Africa’s arable land could be lost by 2025 if that trend continues. Forest experts at the African Forest Forum have called for a greater mobilization of development partners to support the Great Green Wall project. “African countries need to strike the right balance to optimize benefits from their precious forest resources. There is the need to increase the exchange of research information on the value of African forest. The Green Wall Initiative provides the right opportunity for researchers to get to work,” says Dr. Aster Gebrekirstos, a scientist at the World Agroforestry Centre (ICRAF). The African Forest Forum seeks to generate and share knowledge and information through partnerships for better policy making. It also aims to build capacity to improve forest management to address poverty eradication and environmental protection in Africa better.